The murders, part of a robbery spree, could further damage China-North Korea ties. On December 28, 2014, a North Korean soldier (believed to be a deserter) crossed the border into China and killed four Chinese civilians in Nanping village, in the city of Helong in China’s Jilin province. According to South Korea’s Yonhap News Agency, the four citizens were killed in “an apparent robbery” carried out by the North Korean. According to South Korea’s Dong-a Ilbo, the suspect, a 26-year-old North Korean, killed four Chinese citizens (two elderly couples) in their homes before stealing food and cash from another house. At least two of the victims were ethnic Koreans, a man surnamed Heo (aged 60) and his wife. The victims were either shot with a pistol or beaten to death. Dong-a Ilbo reports that the suspect was shot by Chinese police while attempting to flee and is currently hospitalized; other reports merely say the suspect was captured after a manhunt. When asked about the reports, Chinese Foreign Ministry spokesperson Hua Chunying said that “China has lodged representations with the DPRK” (the Democratic People’s Republic of Korea, the formal name for North Korea). Hua added that “China’s Public Security Department is now processing the case in accordance with law.” Though Hua gave no details, her brief remarks served as official confirmation that such an incident had, in fact, occurred. This is not the first time North Koreans have crossed the border and committed violent crimes in China. Yonhap notes that such incidents are “not uncommon.” In a similar case in 2013, a North Korean defector killed and robbed an elderly Chinese couple. China’s Beijing News notes that the village of Nanping, the site of last month’s attack, has seen over 20 villagers injured or worse in similar incidents. Many of the victims are elderly, as younger villagers often leave their homes to find work (including across the Korean border). The incident has the potential to further fray China-North Korea ties, which have been rocky ever since Kim Jong-un came to power. North Korea’s decision to conduct a nuclear test in February 2013, despite strenuous Chinese opposition, sparked a debate among Chinese officials over the pros and cons of continuing to support Pyongyang. In what was widely read as an indication of China’s ambivalence, Chinese President Xi Jinping broke precedent last year by visiting South Korea before the North. Still, the China-North Korea relationship remains a sensitive issue. As Jin Kai has pointed out, China is far from abandoning North Korea, given the geopolitical usefulness of keeping a “buffer state” along the Chinese border. Accordingly, Beijing does not want domestic public opinion about the relationship to become overly negative. That may explain why the murder case went unreported in the Chinese media for over a week, only appearing in online stories on January 5 after South Korean news outlets first broke the story. Yonhap quoted a South Korean official as saying that China and North Korea had reached an agreement not to “officially announce” the incident. Hua Chunying’s comments on the matter in an official press conference, and her announcement that China has lodged an official complaint with North Korea, indicate that this agreement (if it existed) fell through. According to Dong-a Ilbo, both China and North Korea have upped their security in the border area in response to the murders. 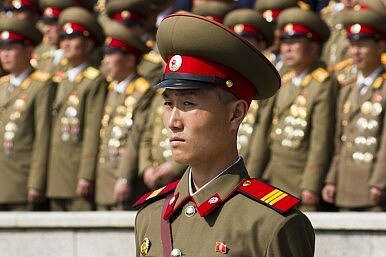 North Korea “has reorganized the deployment of its military units” near the border, Dong-a Ilbo reports, likely in an attempt to prevent defectors from crossing into Chinese territories. China has also increased its surveillance of the border.